Prevent callbacks from new homeowners with our recessed or surface-mount downspout extenders. Stop water from getting near the foundation you just poured with exterior drainage systems. By simply installing some exterior drainage and the foundation is built, you can assure homebuyers that their basement will remain dry for as long as they live in their new home. A gutter system is a key component in doing just that. Too many builders, however, feel the job ends at the downspout outlet. Unfortunately, if you don’t extend the downspout at least several feet away from the foundation, you’re tempting fate. Water is persistent and requires redundant systems to keep it from getting into the basement. Take extra care to drain water from the downspout away from the foundation, and you’re not likely to ever get a wet basement callback again. We have developed several downspout extensions and extension fittings to handle a wide range of grade and landscaping requirements. And best of all, they're easy to install, if you can build a foundation or lay a foundation footer, you can install some simple exterior drainage systems to protect the home from future water problems. With each product, we went beyond standard specifications for plastic thickness, UV resistance and durability. Our downspout extensions and outlets are designed to give you years of trouble-free service. Prevent basement flooding due to frozen discharge lines with our patented IceGuard® protection system. 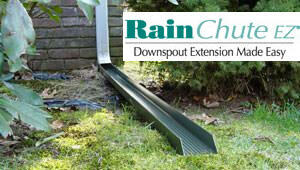 RainChute® is a recessed channel that directs water away from the foundation. Compatible with 3-in. or 4-in. downspouts, it requires only a shallow trench. Lawn mowers roll over RainChute® without causing any damage. 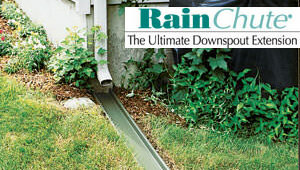 RainChute EZ®® is a surface installed downspout extension. Use it where a mulched garden bed is planned. Compatible with 3-in. or 4-in. downspouts, RainChute EZ® carries water 3 to 8 feet away from the foundation. 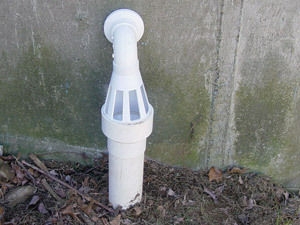 LawnScape™ Outlet® is a great way to terminate a standard 3-in.-diameter underground downspout extension. Use a transition elbow fitting to connect the drain pipe to the downspout. The lid of the LawnScape™ Outlet is removable for cleaning. LawnScape™ Well® may also be used to terminate a downspout extension. It couples with either a 3-in. or 4-in.-dia. drain pipe and may be used to solve many drainage problems in the yard. IceGuard® The IceGuard® discharge line is a protection fitting that attaches to the top of each sump pump discharge pipe. Out-flow ports allow water a second way out should the discharge pipe clog with ice or debris. No water escapes through the holes unless the discharge line is clogged. Contact us for more info or a catalog that includes more information about these exterior drainage products. The catalog has over 25 basement waterproofing products that general home contractors and foundation contractors, like you, use everyday to promise dry basements for their clients! Call Us For A Catalog!